COCHABAMBA, Bolivia — Benjamin Obando is surrounded by death. The 11-year-old boy works at a cemetery, praying, singing and fetching water for relatives of the dead. "I bring money home for my family, to give them food," said Obando, who earns about $3 a day. He isn't afraid to work among departed souls, but said he hurries to leave the graveyard before 7 p.m. because that's when "little ghosts appear." In 2014, Bolivia lowered the age children could work for themselves or their families to 10, the lowest minimum age for labor. Children can work for others when they are 12. Previously, Bolivia's minimum working age law in all cases was 14. The United Nations, the International Labor Organization and other groups have urged Bolivia to repeal the law, arguing it lacks strong protections for the young child laborers. But in a country with a 39 percent poverty rate — despite an economic turnaround in recent years — the children's wages can be a lifeline for their families, pitting their safety against their own survival or that of their families. Bolivian President Evo Morales has resisted calls for repeal, saying children have the right to work. Last week, he reiterated his support for children and adolescents and unveiled new decrees to protect them. One decree gives free legal aid to victims of violence. Another mandates paid leave for parents if their children are critically ill. A third order requires the news media to spread — free of charge — "messages of love, affection, respect, appreciation and dignity toward children and adolescents and against violence." Morales, who herded llamas at 6, told reporters that the government has a duty "to protect the greatest treasure that is the future of Bolivia. We have to take care of future generations." Critics said Morales' additional rules aren't enough. "Many laws are written that aren't followed," said Marcos Gandarillas, a sociologist in Cochabamba in central Bolivia. The debate is taking place in a economically improved Bolivia, which government supporters say Morales has helped make better for children since taking office in 2006. Poverty has declined over the past decade. And in 2017, the Bolivian economy grew by 4 percent, higher than any other South American nation, according to the World Bank. "Bolivia is experiencing the longest period of democracy in its history — 35 years," said Hernan Rico who helps enforce the laws to protect children. Rico is the leader of the government's Delegation on Children and Adolescents in Cochabamba. He said child workers helped write the 2014 law, which established harsh penalties for bullying, harassment, sexual violence and infanticide. The law also called for registering child workers as a way of tracking and protecting them, but that system isn't yet in place. Rico acknowledged the law has faced "administrative difficulties," but said the government is progressing. "The most difficult part is not the children, but the openness of adults" toward allowing children to work, said Peter Strack, a sociologist in Cochabamba. "The law has lost momentum," he said. According to UNICEF, some 850,000 children work in Bolivia. Keeping them safe is a daunting task, child advocates say. Crime, violence and other perils threaten many young people, especially the poor. Natalia Calahumana said she sold candy and gum on the streets at age 7 after her father abandoned the family. "I learned to shine shoes at 8," she said. "At 9, I started to weave." She said she didn't like living at home because it was painful to see her mother cry all the time over money troubles. So at night she curled up in a cardboard box on the street. Back then, she said she ate whatever she could find, including restaurant leftovers. At 11, Calahumana said a stranger drove up and asked her to come work for her. "I believed everything the señora said. I would be fine. I would have something to eat. I would have clothes." So she climbed into the woman's car. "I didn't want to be on the streets anymore," Calahumana said. "I took care of a little girl she had. I cleaned all the bedrooms. I cooked." And it was fine — at first. But the job turned into a nightmare when the woman locked the child in her house and forced her to work for no pay. 'No,' she told me, 'you'll steal everything. I have jewels. Everything is gold.'" One day, Calahumana said, she accidentally broke a plate. The woman picked up a shard of glass and cut her with it. "She would cut my hand to say 'you'll never break anything again.'" Calahumana finally escaped after the señora forgot to lock the door. Now, more than two decades later, she has three children of her own. "My dream is that my children be something in life, not like me," said Calahumana, 34, who lives in El Alto, Bolivia's second-largest city. "That's why I work. I wash clothes. I shine shoes. I sell newspapers, gum, candy. I do everything so my children don't have to do what I do." Some experts question whether Bolivia has the resources and capacity to protect child workers. 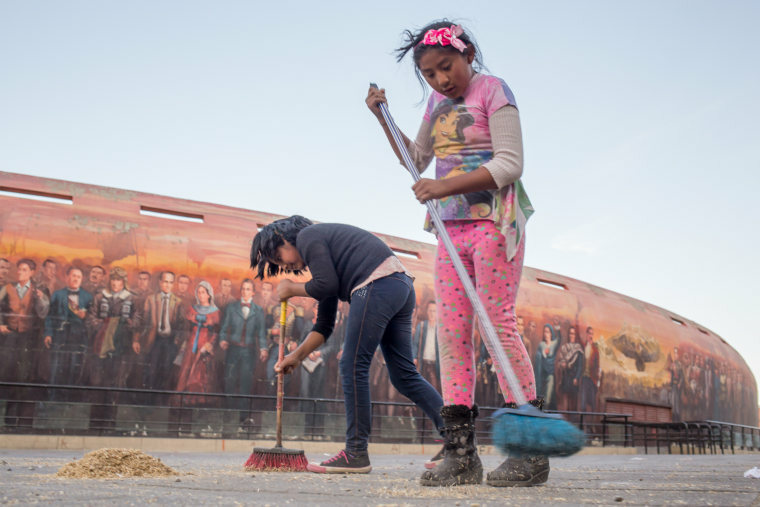 Bolivia had only 12 child labor inspectors in 2016 and up to a fifth of country's municipalities lacked a child protection advocate, U.S. officials said. Bolivia reported that it carried out "250 targeted child labor inspections" in 2016. That was "inadequate to address the scope of the problem, particularly in rural and hard to reach areas," the U.S. Labor Department said. The Bolivian government did not disclose statistics on child labor investigations, violations, prosecutions or convictions, according to the department. Bolivia's Ministry of Labor had been expected to release the results of a child labor survey in 2017, but publication was postponed over disagreements about how to interpret the data, a source told NBC News on condition of anonymity. Child advocates hope the results will help identify workers most in need of protection. In 2008, 60 children died in accidents and caveins at Bolivia's Cerro Rico mine, National Public Radio reported in 2013. The number of Bolivian children working in mining and construction, another hazardous occupation, rose from 2001 to 2012, Bolivia's National Institute of Statistics reported in May. The average monthly wage for children and adolescents was $201 in 2014. Many Bolivians shun low-wage earners, workers say. Shoe shiners often wear ski masks so they won't be recognized. A masked shoe shiner who goes by the nickname "Universal Soldier" said he started working at age 7. His family needed the money after his parents divorced. At 9, he worked for a carpenter, making and sanding chairs. But he said he wasn't paid a wage for five months. "He only gave me lunch," Universal Soldier said. "But I worked all day — 14 or 15 hours per day. It wasn't fair." After he told the employer he was going to report him, the carpenter threatened to kill his brothers. "Since we were just children, we were afraid we'd never see our younger brothers again," said Universal Soldier, now 20. So he kept his mouth shut. Despite such episodes, he has no regrets. "A child who starts working very young appreciates what he earns with the sweat on his brow," he said. "You learn to appreciate life, to appreciate every cent that you earn."